(Nanowerk News) JQI experimentalists under the direction of Ian Spielman are in the business of using lasers to create novel environments for neutral atoms. For instance, this research group previously enticed electrically neutral atoms to act like charged particles moving in magnetic and electric fields. The behavior of particles in strong electromagnetic fields, along with arbitrary control of the said fields, is central to both condensed matter physics, and quantum information science. As an extension of their work on generating synthetic fields, these researchers have developed a new kind of lattice for atoms. This lattice does not arise from a spatially varying light intensity pattern, as is the case for traditional optical lattices. Instead, it relies on the using effective magnetic fields to shift around the atomic energy levels. Additionally, as the atoms move through this lattice, they modify their internal state. The result, to appear in Physical Review Letters ("The Peierls substitution in an engineered lattice potential"), offers another experimental tool for using an atom-laser system to realize complex many-body phenomena familiar in condensed matter systems. Lead author Karina Jiménez-García explains the broader goal of the team, "We are focused on quantum simulation with ultracold neutral atoms. Basically, we engineer the landscape in which atoms live, such that they are described by the same mathematical equations as electrons in a solid-state material. Thus the physics in these two systems will be the same." Figure 1: The energy level diagram shows how the different atomic energy levels (labeled [-1], , and [+1]) are connected using effective magnetic fields. The red and grey arrows labeled with "?R" refer to the Raman laser beams. The black wavy arrows labeled "?rf" indicate the rf magnetic field. 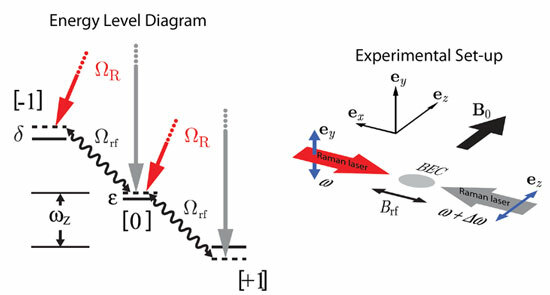 The experimental setup shows how the lasers were applied to an atomic Bose-Einstein condensate (Fig. courtesy of authors). Here, they would like to understand how large magnetic fields affect 2D electronic systems; but the required magnetic fields are difficult to implement and control in material systems. Scientists hope to use laser-atom systems to overcome this hurdle. Recently, Spielman's group at NIST used lasers to make neutral atoms act like charged particles moving in magnetic fields (Lorentz force). In their current work, the laser radiation generates an effective magnetic field that changes the relative energy of atomic levels (called a Zeeman shift; energy levels shown in Figure 1). A gas of atoms may not seem like a solid, being nearly 10-billion times less dense, but this matter can behave much like a crystal found in nature. Solids are composed of a repeating pattern of atoms called a lattice. The electrons can become effectively detached from their parent atoms (particularly in metals), and travel freely through the lattice. For over a decade, scientists have been able to construct crystals directly from ultracold matter using lasers ("optical lattices"). The neutral atoms are analogous to the electrons in a crystal, where a laser interference pattern provides the lattice structure. Atoms can hop from lattice site to lattice site through a process known as tunneling. The main requirement for generating a lattice is to create an environment wherein the atoms experience a force that changes at regular intervals in space. The lattice created here, while partially engineered using lasers, does not arise from a repeating pattern of light intensity. Instead laser and radiofrequency (rf) fields are applied such that the atoms appear to be in the presence of a periodic magnetic field. Picture a row of bar magnets, lined up with their north and south poles alternating. Now take an atom, which can be thought of as a little magnet, and imagine bringing it close to the row of bar magnets. It will be attracted and repelled depending on its orientation with respect the magnet array. Just like in the optical lattice, atoms are free to tunnel, but with an added feature. With such experimental arrangement the atoms also make transitions between energy levels as they hop through the magnetic lattice. Figure 2: (Credit: E. Edwards/JQI). In the experiment, about one hundred thousand atoms are cooled to nearly zero temperature. To achieve a lattice, the scientists illuminate the atom cloud with laser and RF radiation simultaneously. Figure 2 is a cartoon depiction of how this might work in atoms having two energy levels. 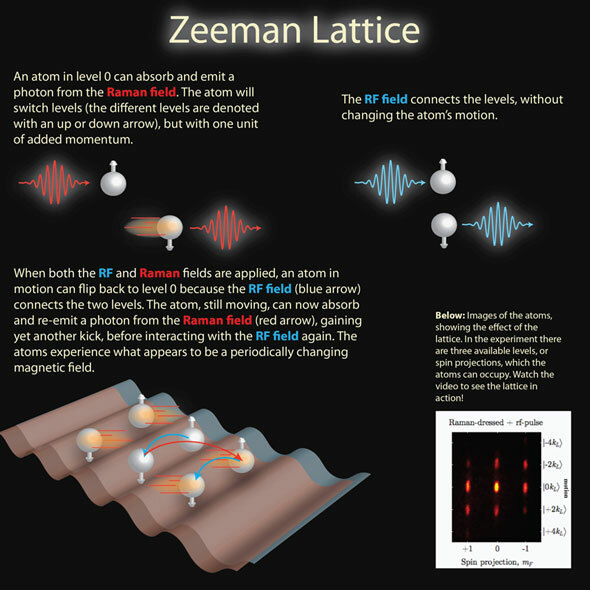 Radiation from pair of "Raman" beams changes the relative energy of the atomic levels, analogous to a Zeeman shift. The laser-induced Zeeman effect depends on the energy-momentum state of the atom. But the lasers alone do not provide a lattice because the atomic energy levels are not shifted periodically in space. Radiofrequency (RF) radiation is the missing ingredient for the magnetic or Zeeman lattice. Here the RF magnetic field provides the energy that allows the atom to change levels ("orientation" in the magnet analogy), regardless of its position in space. The scientists verify that the atoms experience an effective lattice by inspecting their velocity and spin distribution after releasing them from the atom trap. In the presence of the Raman magnetic field, the researchers switch on and then off the RF field, which briefly flashes on the lattice. The atoms are accelerated into higher momentum (motional) states by the lattice, giving rise to the appearance of extra clouds. This is called matter-wave diffraction and is shown in Figure 2. Why not use real magnets instead of lasers? The atomic system in sensitive to energy and how that energy is applied is only a matter of choice. Controlling and adding arbitrarily large "real" magnetic fields is extremely difficult and limited. In contrast, the technology to control laser fields is inherently simple. To simulate the physics of a 2D electron gas in an intense magnetic field the team proposes generalizing these experiments to the two-dimensional Zeeman lattice.